This bug has now been fixed upstream. An update has been issued. If you still cannot install, ensure you have updated fully, and then restart your computer. And clicking install just loads and nothing changes. This shows for all the packages I try and install. 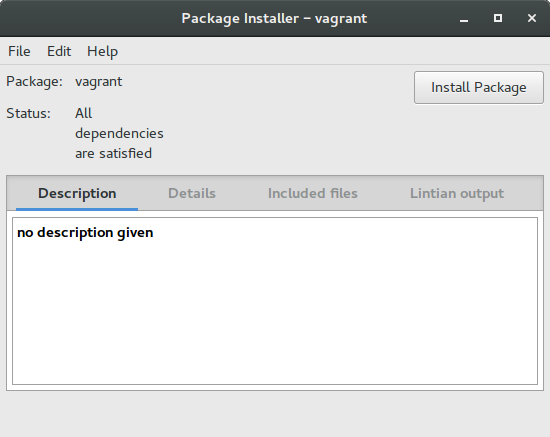 How can I install a package? This is bug #1573026. Make sure you click the "this affects me too". This bug has now been fixed upstream. Hopefully an update will be issued promptly. You can use the GDebi package manager, available in the software centre or with sudo apt-get install gdebi via the command line. Then, to install the package, open GDebi and click File -> Open and navigate to the downloaded DEB file. It can take a little while to add the open the package - it took around 10 seconds for me. Then check everything is OK, and click install. It will finish, and the program will be installed. Or we can use the command line. While apt-get cannot install from a DEB file, all apt-get does is download the file and then call dpkg. We can do those tasks ourselves really simply. Open a terminal and navigate to our download location with cd. replacing FileName with the name of the file. This "fixes" everything - it resolves all dependencies etc. All .deb files which you manually install are considered to come from 'third party' locations where the system cannot verify the license on the software. 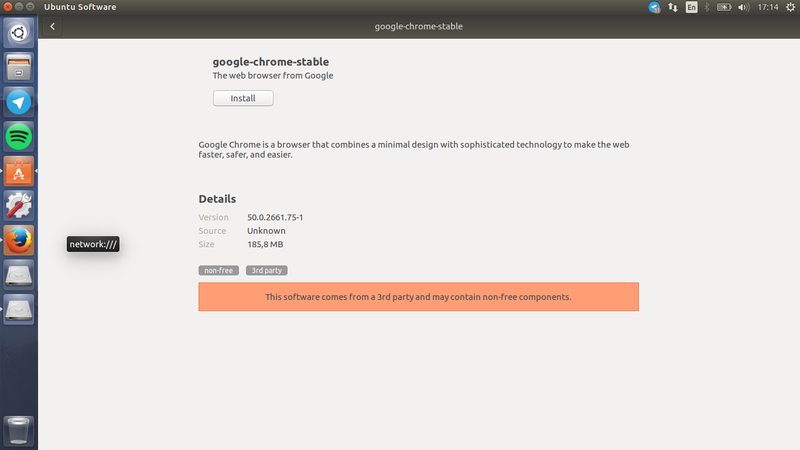 The Google Chrome installer as such originates from Google, a third party, and not the Ubuntu repositories - the warning message here indicates this, but since it can't verify the license terms, it also says it may be non-free. Google Chrome is still OK to use. The message you see there serves as a warning in the event that you want to make sure it's a 'valid' install or something able to be trusted, and is just a notice that the software doesn't originate from the Ubuntu repositories; it also indicates that some of the software from there may be non-free and may have other license restrictions on it. It is more or less a way to let you know there may be other things to keep in mind - that the software is not Ubuntu-maintained, or may have non-free license restrictions - before you install the software from that .deb file. Lets go and use the manual method of installing. In the terminal, we can manually install. I'm assuming you saved the .deb to your user's Downloads folder. Replace "PACKAGE" with the actual filename here. You should also run apt-get install -f after the dpkg -i just in case there's dependencies that need resolved - apt-get is capable of determining the dependencies issues, but dpkg is not. I had this problem. It appeared that I've installed 32-bit version of Ubuntu by mistake but I thought that I have a 64-bit one. So when I tried to install 64-bit .deb packages I got this problem but when I tried to install 32-bit .deb packages later they have been installed smoothly. Enter password, then try to reopen app with Ubuntu Software Center. Press Enter, put in your password. Press Enter. After that I was able to use the Software Center, open it and install all the OS Updates. The simplest which ensures that it can download any dependencies alongside. Which sometimes the gdebi GUI does not download (faced this problem myself). This should download dependencies if needed and will install your app successfully. Not the answer you're looking for? Browse other questions tagged software-installation software-center deb or ask your own question. I cannot install deb files with the software centre. What are the immediate workarounds? How to install pdftk on Ubuntu 18.04 Bionic? How can I install the Opera browser from the terminal? Why do signed deb packages say they're not authenticated when copied to my private deb repo? Safe to remove downloaded .deb packages after install?